People often ask me what my favorite types of food are and I often surprise them when one of first things I will say is pizza. That’s right, pizza is at the top of my list. In fact, I’d even go so far as to say that pizza is crucial to my existence. It is very rare for me to go longer than a week without having a slice and I always stop for pizza on the way home from the airport after any traveling I do because, let’s be honest, pizza outside of the tri-state area, well, it’s just not the same usually (sorry Chicago, I haven’t had the pleasure of visiting you yet!). I will forgo so many other types of food if given the choice of pizza. Thick or thin crust, it doesn’t matter, I only discriminate based on my food mood, in other words, what I am craving that day? It may seem like a very simple dish so many of us cannot live without, yet in reality pizza is anything but simple as any pizza expert will explain. 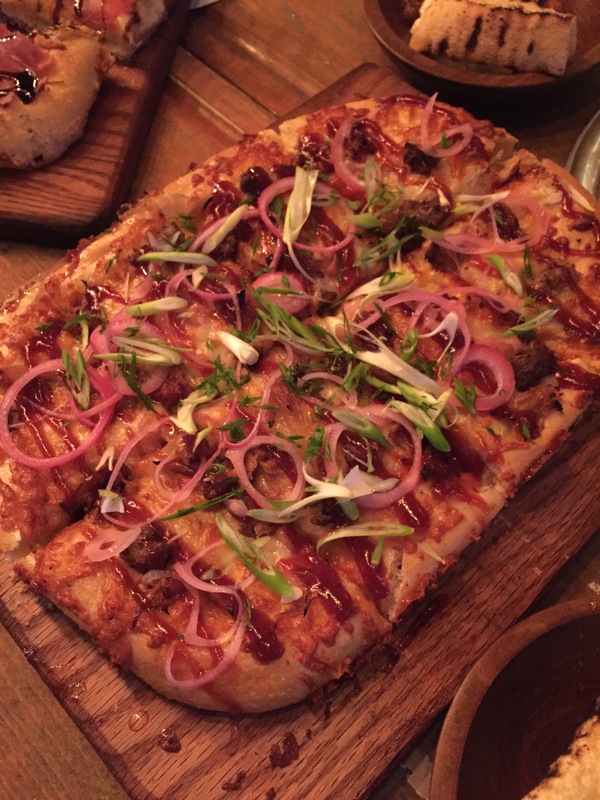 In fact, there are many different methods for producing different types of pizza dough along with its own scientific principles and theories; there is really so much more to creating a pizza than throwing together dough, sauce, cheese, and various toppings. 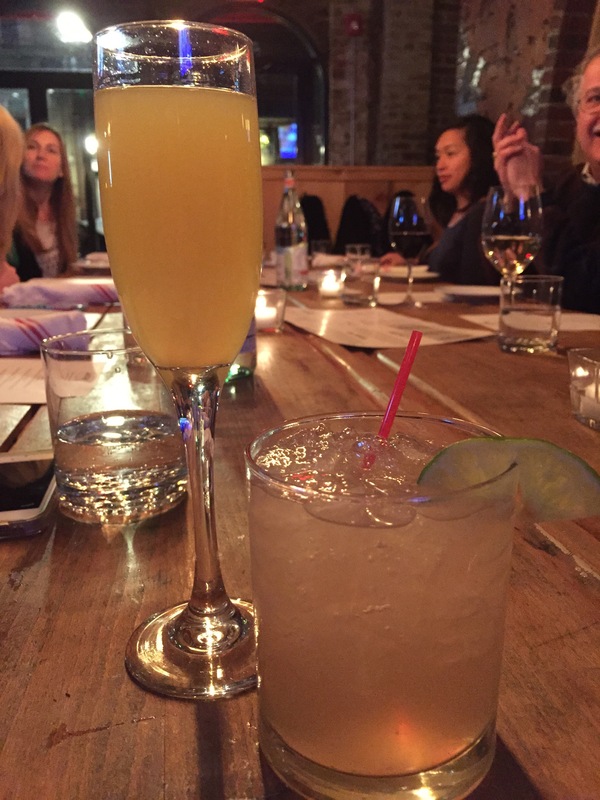 We recently had the pleasure of being guests at a media dinner at Amore Cucina & Bar in Stamford. For all you Stamfordites, yes, this is the old Amore Cucina & Bar formerly owned by Al Carozza located in the Sprindale section of Stamford, but the restaurant has been redesigned and is now under new ownership by a six time World Pizza champion, Food Network judge, and restaurateur Bruno DiFabio. 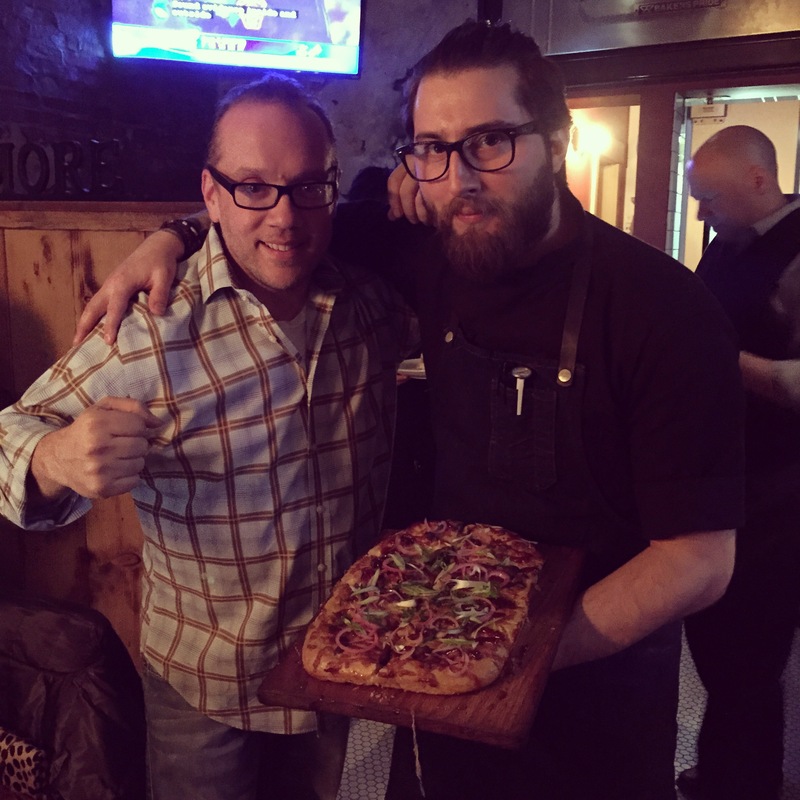 Also known as “Pizza Geek,” “Dough Boy,” and “The Fastest Pizza Maker in the World,” DiFabio is also the owner of The Academy of Pizza Science, a consulting company which helps new pizza restaurant owners to hone their skills and learn the science behind making pizza. 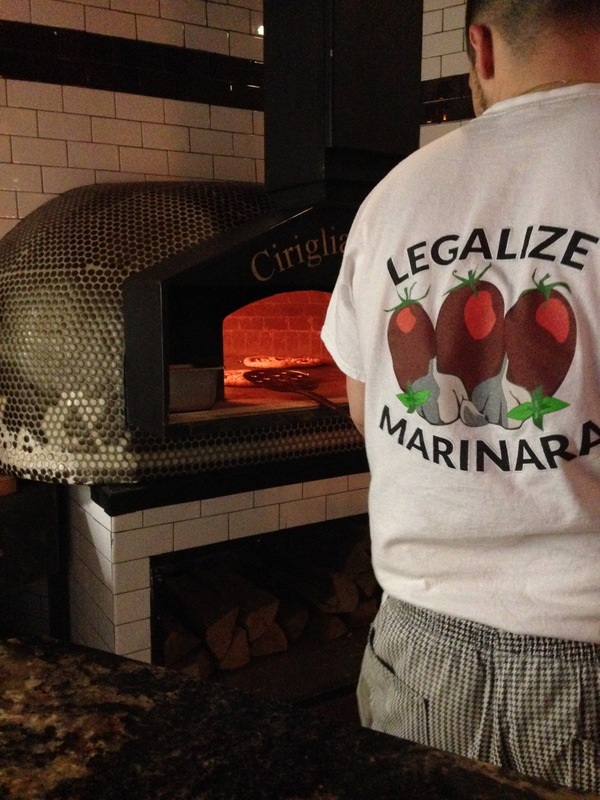 In other words, DiFabio is a leader in the pizza making world and he takes his pizza very seriously. 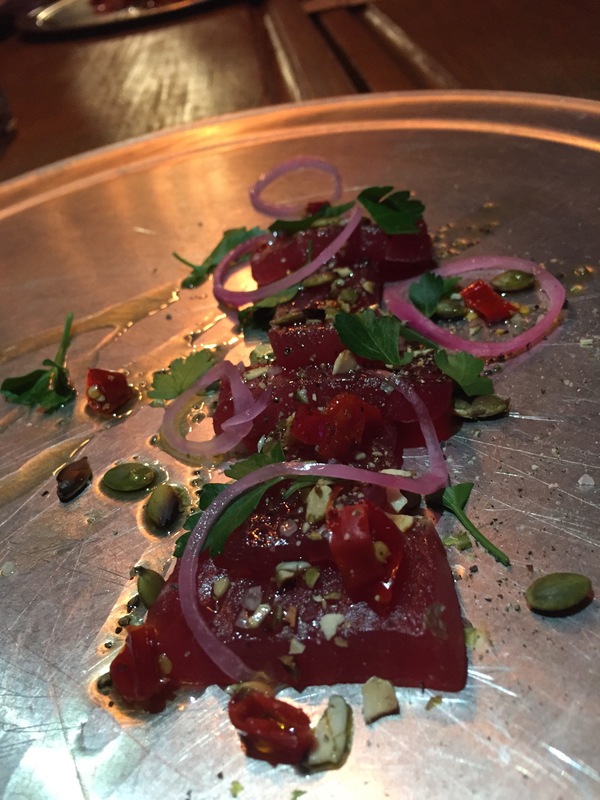 If the name of Executive Chef Jared Falco sounds familiar, it should. Formerly the executive chef at Washington Prime, Falco puts his signature touches on several of the dishes we tried this evening at Amore. If Falco is cooking, I am on board with a fork and knife in hand! 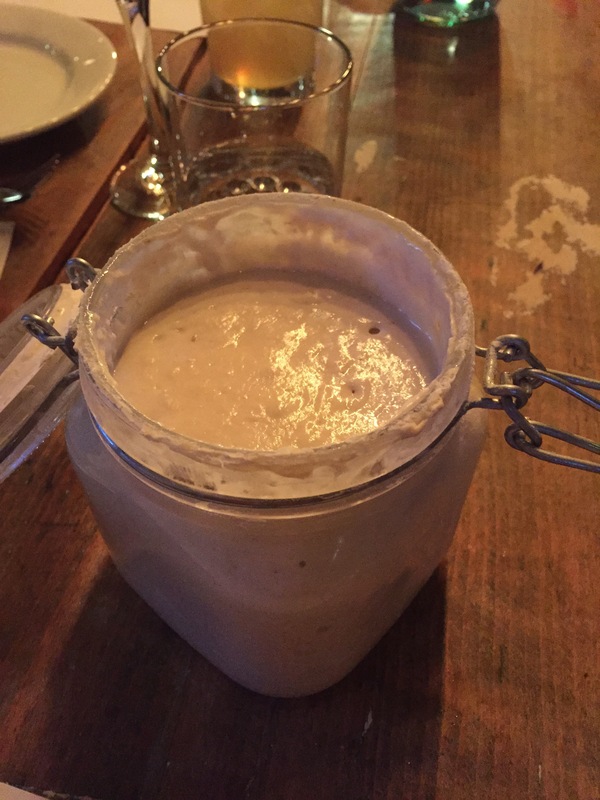 The yeast used to make DiFabio’s pizza pies. We began our meal with pizza, of course! Amore offers two types of pies – round and square – and six different flavors for each style. A third option is to order round or square pies “As You Wish” (love the movie reference! ), in other words with the toppings of your choice. 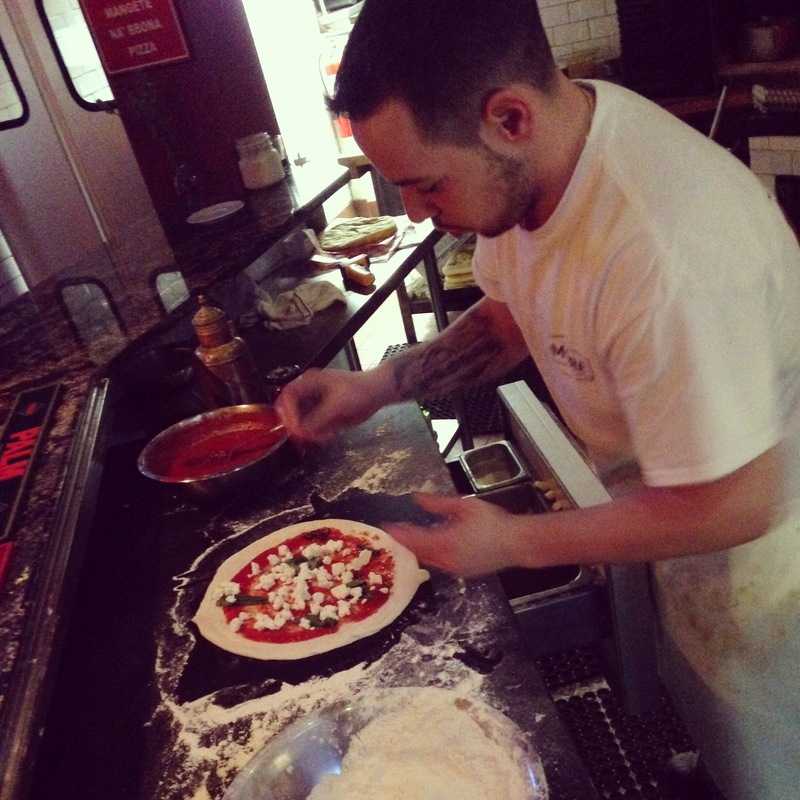 The round pies are Neapolitan style pizza certified by the Italian Associazone Pizzaiuoli Napoletani (APN). The APN, an association formed in Naples by pizza makers to preserve the authentic Neapolitan pizza values, requires a rigorous certification process for any restaurant wishing to serve authentic Neapolitan pizza and very few pizzaiolos in the United States are certified. Cooked in a wood fired oven at 900 degrees for 90 seconds or less, Amore’s round pies are crunchy on the outside and soft and pillowy on the inside creating a chewy consistency. We sampled four of Amore’s round pies: For The Queen (above), The Holy Cheesus, New Haven White, and Something Fishy. All four pies were fantastic and I would recommend them all, it really is a matter of personal preference. 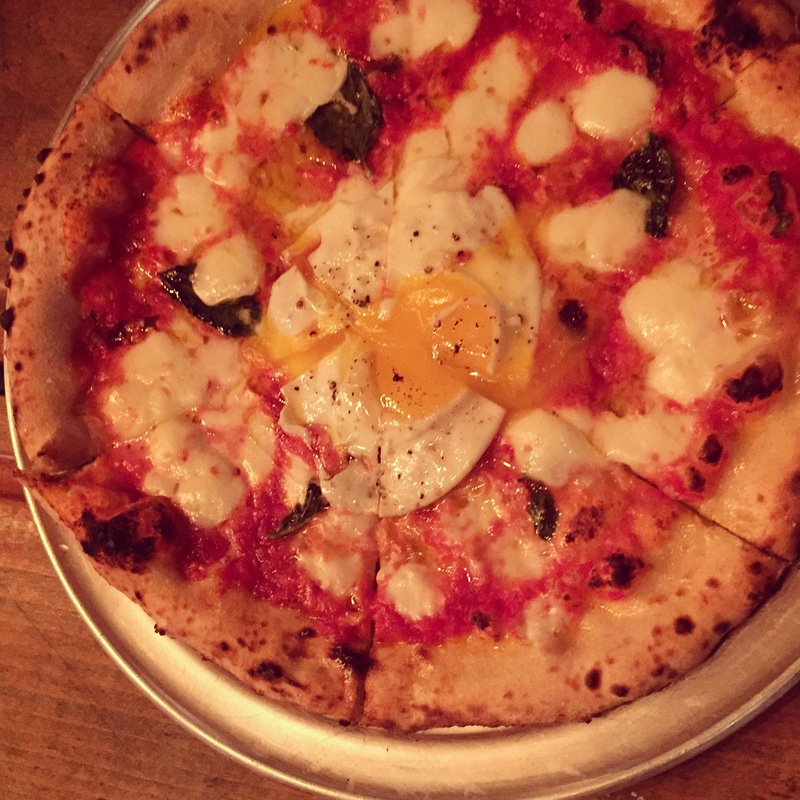 The For The Queen is made with San Marzano, flor di latte mozzarella, pecorinio romano, basil, and a local egg on top. 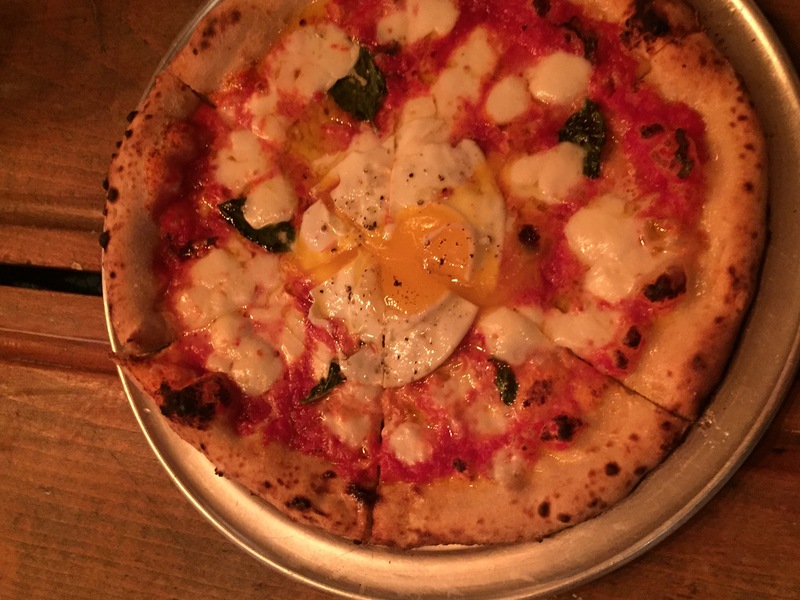 Who would have thought – a pizza topped with an egg that isn’t a breakfast pizza! For The Queen was a hit with our group. Next up was my personal favorite: The Holy Cheesus. 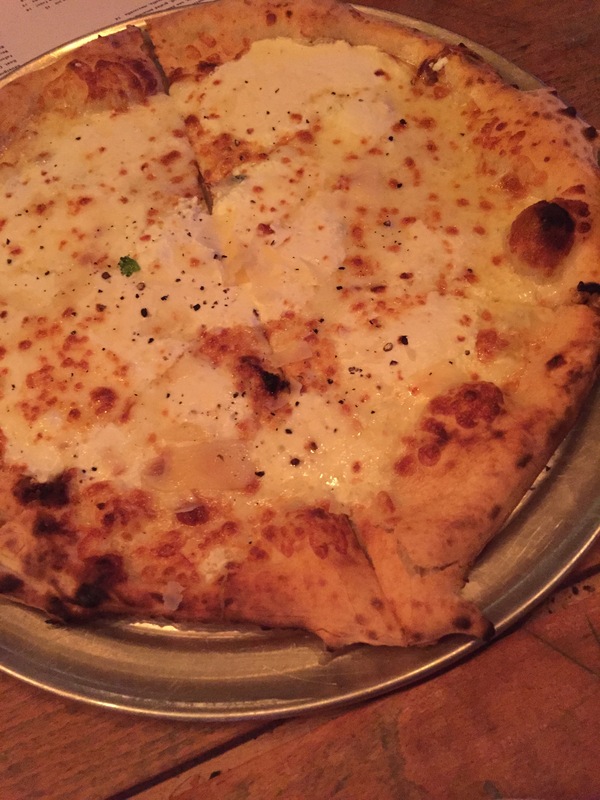 House Mozzarella, pargigiano reggiano, pecorino romano, fontina, and burrata top with gloriously cheesy pie. Why was this my favorite? I am all about the cheese! This white pie is not heavy at all, and instead the combination of flavors from all five cheeses along with the smooth, creamy texture, which I attribute to the mozzarella and burrata cheese, make this pie worth worshipping. In fact, I’ve ordered this pie on return visits to Amore because I just can’t get enough of it. 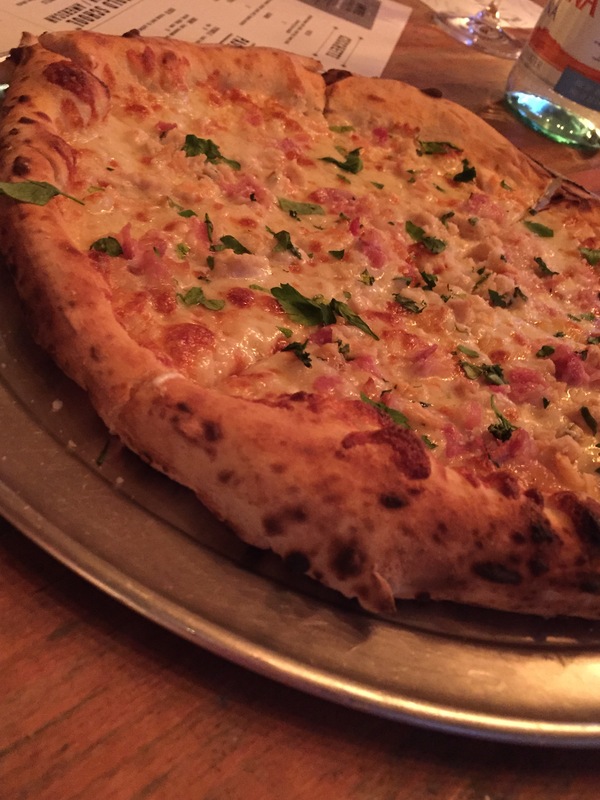 Seafood lovers, Amore has you covered with two pies: Something Fishy and New Haven White. White anchovies, capers, garlic, calabrian chilies, and pecorino romano come together to make a pizza that is slightly fishy (I mean, there are anchovies on top), salty, and with some heat to it. 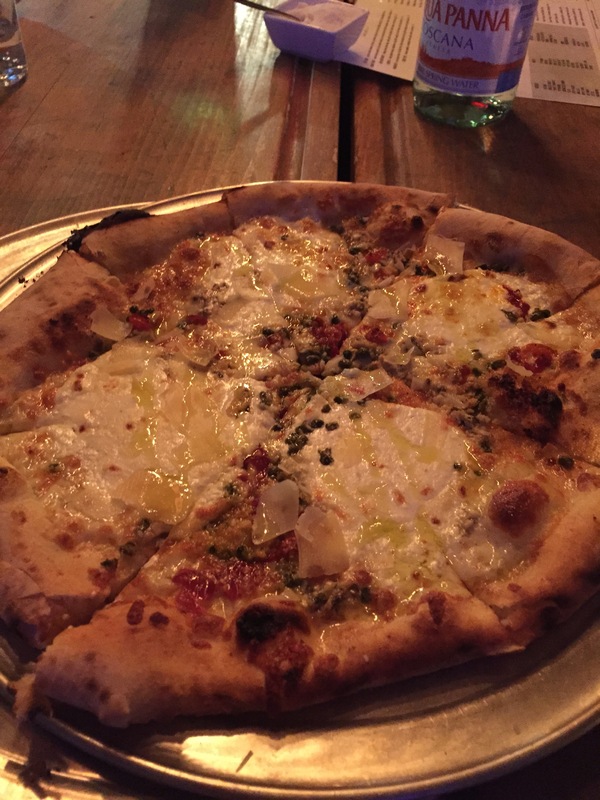 A tribute to New Haven and its famous New Haven-style pizza topped with little necks, Amore’s New Haven White is also topped with little necks along with Amore bacon, house mozzarella, and smoked lemon juice. After trying this pizza, I would say that the tradition of the New Haven white clam pizza can now be found in Stamford too! The square pies at Amore are made in a gas fired brick floor oven and shaped in a double gauge steel pan; the square pies are much thicker and heartier than the round pies and remind me of a Chicago-style pizza in regards to the amount of dough and crust. 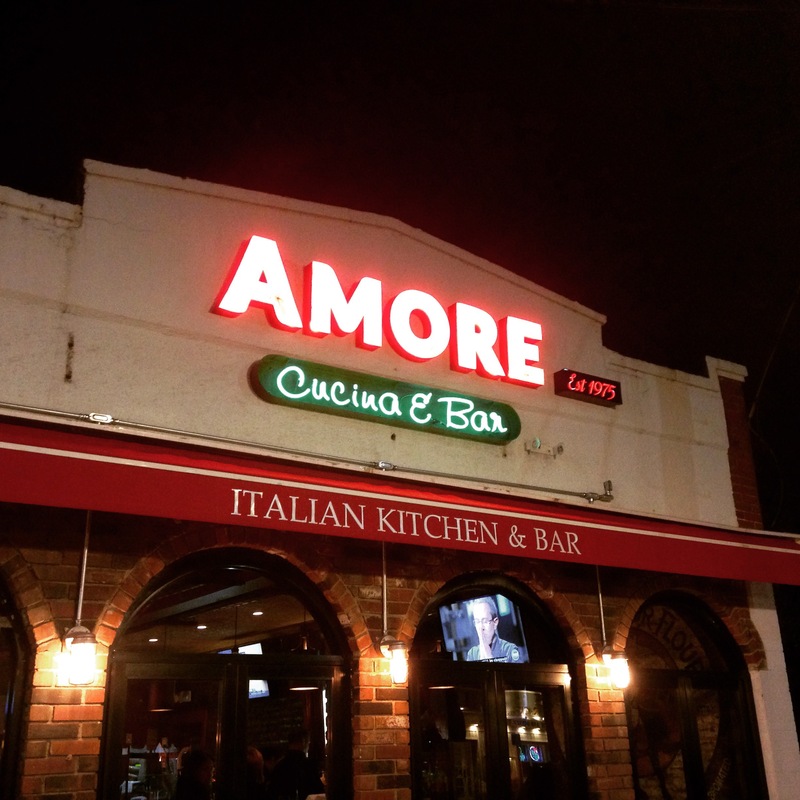 If you’re looking for a heartier pie, then the square pies at Amore are the way to go. 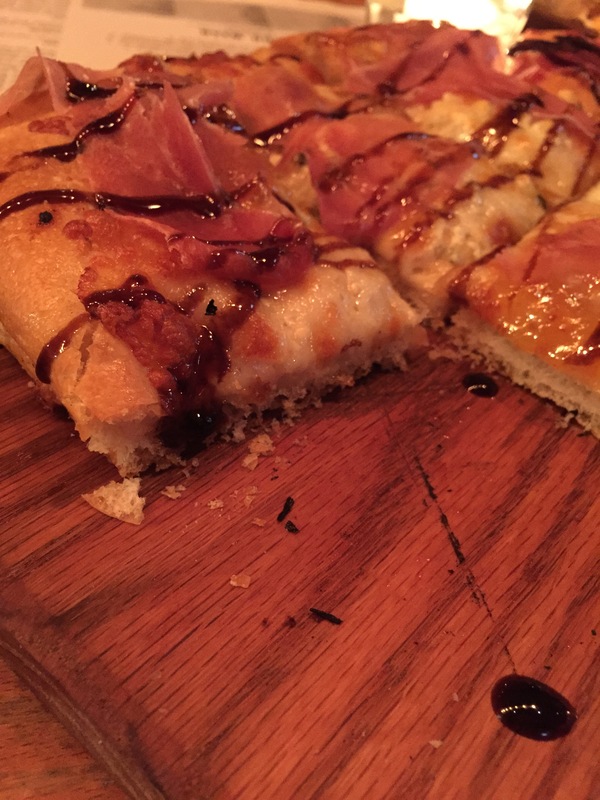 We sampled two of the six square pies Amore offers: Pitt Master is topped with pulled pork, red onion, mozzarella, BBQ sauce, and agave nectar, and Juliet made with house mozzarella, gorgonzola dolce, fig jam, prosciutto, and agrodolce. After enjoying so much pizza we moved onto greens and several small plates which were truly just as impressive as the pizza. Whipped sheep’s milk ricotta, dried figs, honey comb, and charred fig jam comprise this small plate that I could not stop eating. The creaminess of the ricotta takes on the flavors of the sweet figs, honey and fig jam. This dish was delicious spread it on top of the crusty ciabatta it is served with or eaten by itself. 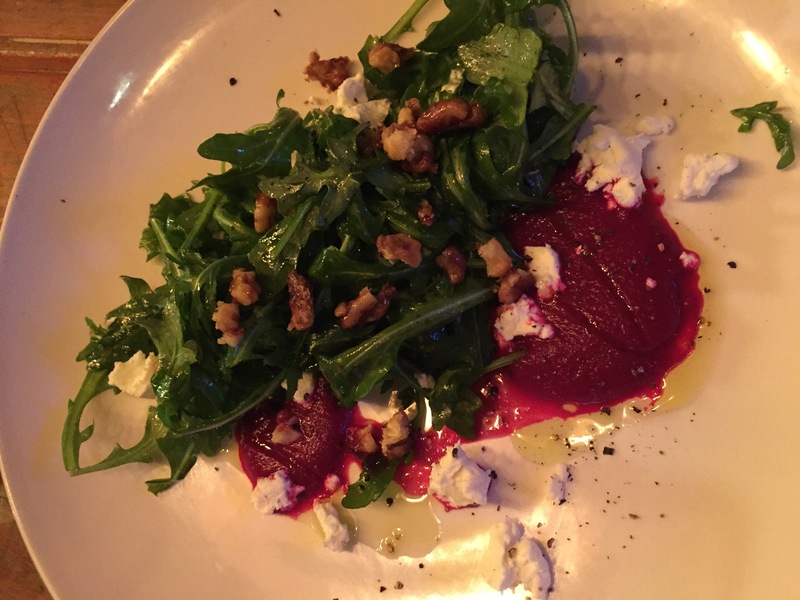 The Arugula and Beet Salad is made with roasted crimson and golden beets and topped with goat cheese and candied walnuts. The blood orange thyme vinaigrette ensure this dish is light and refreshing. 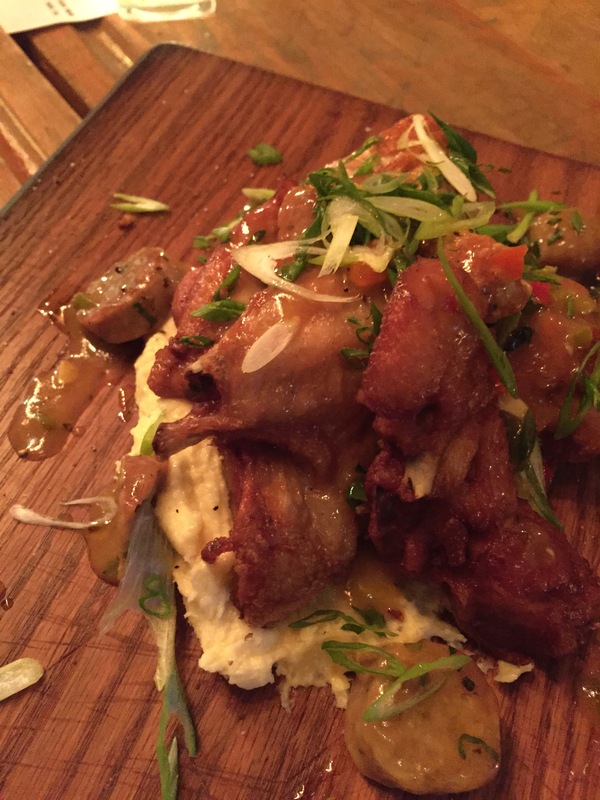 Can we talk about how much I love octopus, and especially the Octopus Puttanesca at Amore? 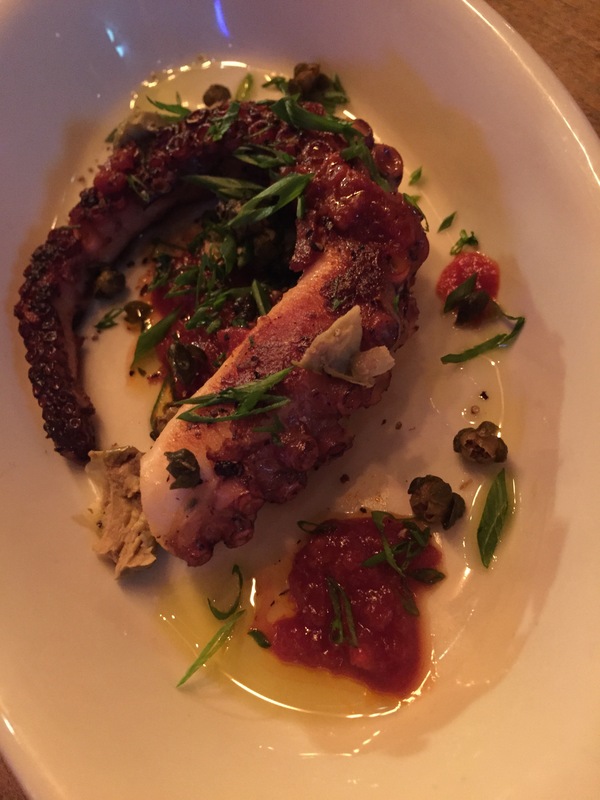 The Octopus Puttanesca is made with tomatoes, capters, siciily olives, garlic, and n’duja sausage. 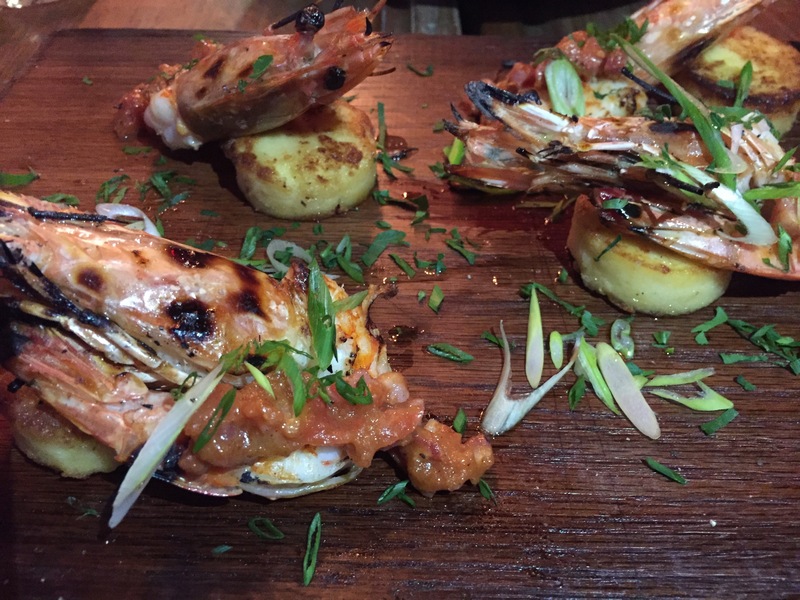 Quite possibly some of the best I’ve ever had, you can taste the perfectly grilled octopus along with the flavors of the other ingredients. 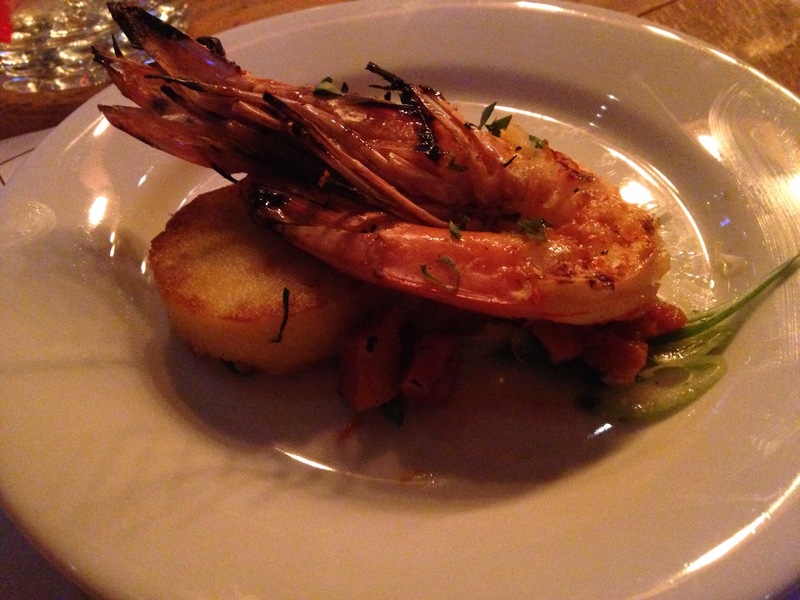 The seafood small plates continued with a Tuna Crudo made with Calabrian chiles, tasted pumpkin seeds, red onion, and torn parsley, and Shrimp and Polenta comprised of shrimp, tomato, house bacon, and polenta. 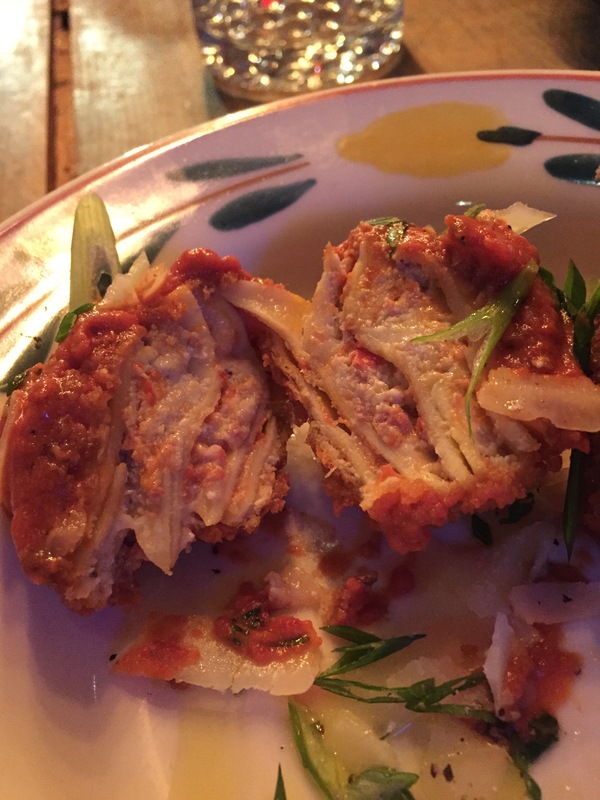 The Chicken Scarpariello is an entrée on Amore’s menu which we tried family-style. This popular Italian dish is made with house sausage, peppadew, garlic, Italian polenta, and green shallots. I saved the best for last. 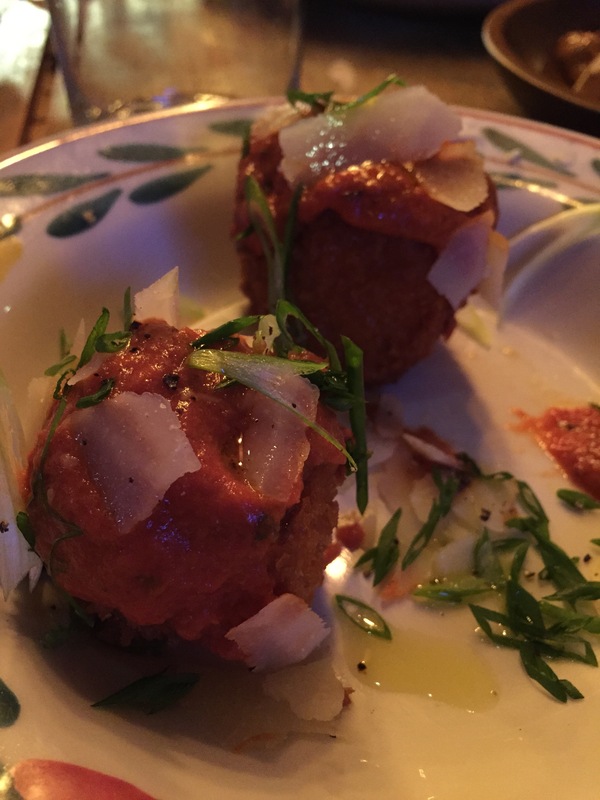 If you order nothing else when you walk into Amore, you must, must, must order the Lasagna Balls. I would drive to Stamford simply for this small plate. Seriously. 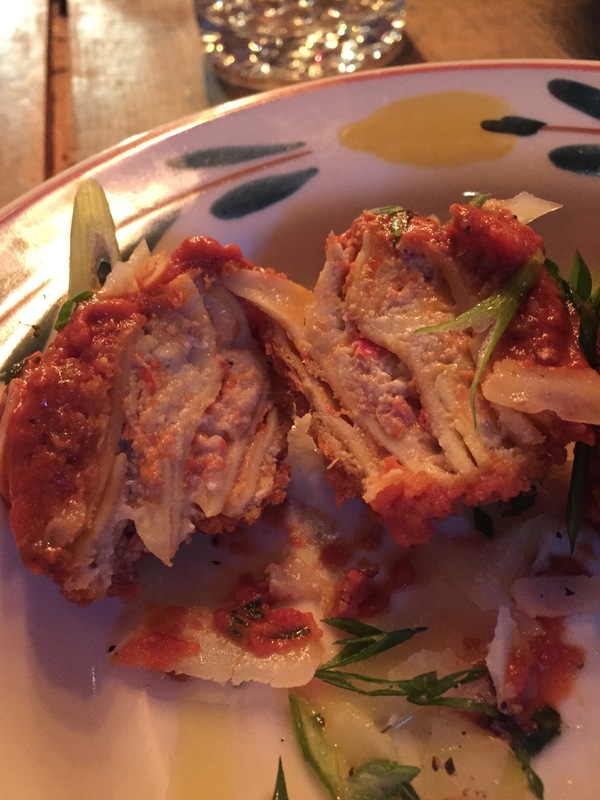 Lasagna is made with Sugo Bolognese and ricotta and then scooped into meatball-sized balls and deep fried. Deep. Fried. Lasagna. Balls. Are you on board yet? The Lasagna Balls are not greasy or heavier than you would expect a typical piece of lasagna to be. You can expect a slight crunch on the outside due to their being fried. Ordering tip: since they are a small plate item you get two Lasagna Balls per order and I promise you are going to want your very own order. The final course, and my favorite at any restaurant, was dessert. Yes, we saved room for dessert! 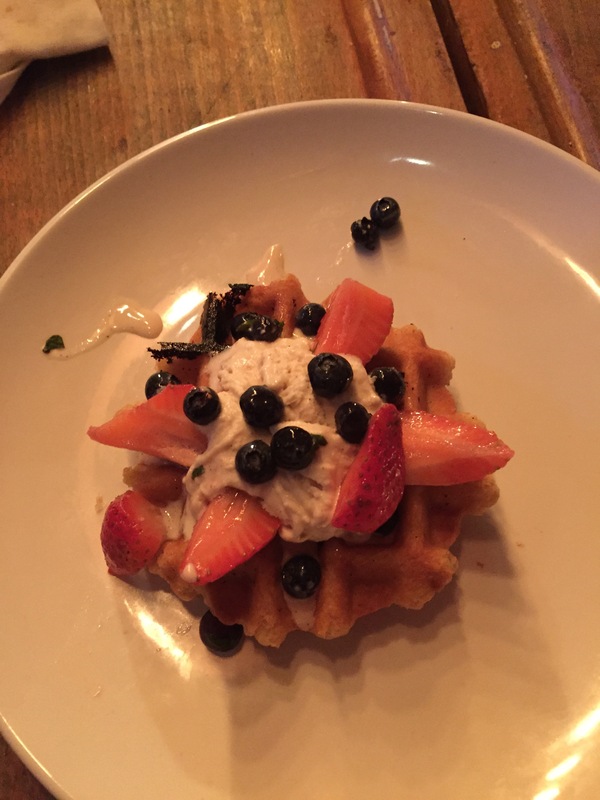 The Dolce is a budino and fat pizzele topped with butterscotch, whipped cream, and berries. The pizzelle is soft and chewy and the butterscotch added a little extra sweetness which was pleasantly surprising. 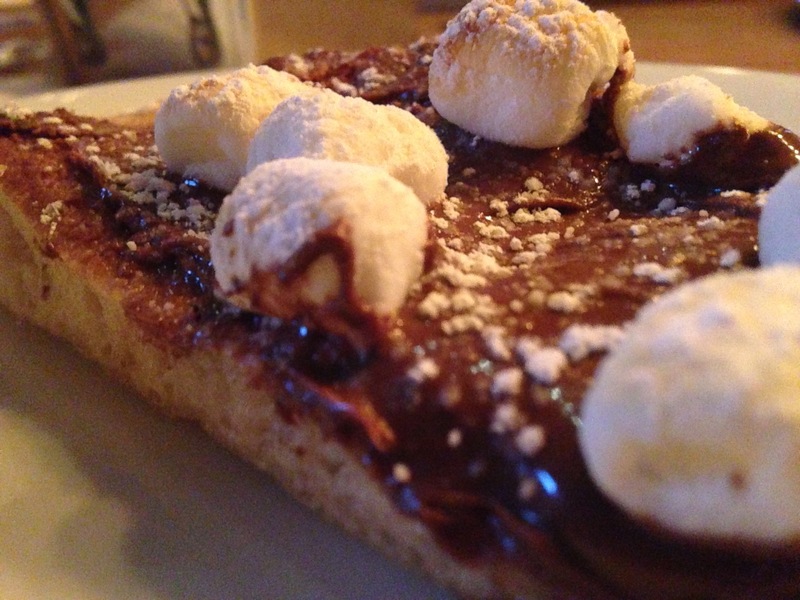 Nutella Pie is pizza dough baked and topped with nutella and marshmellows. 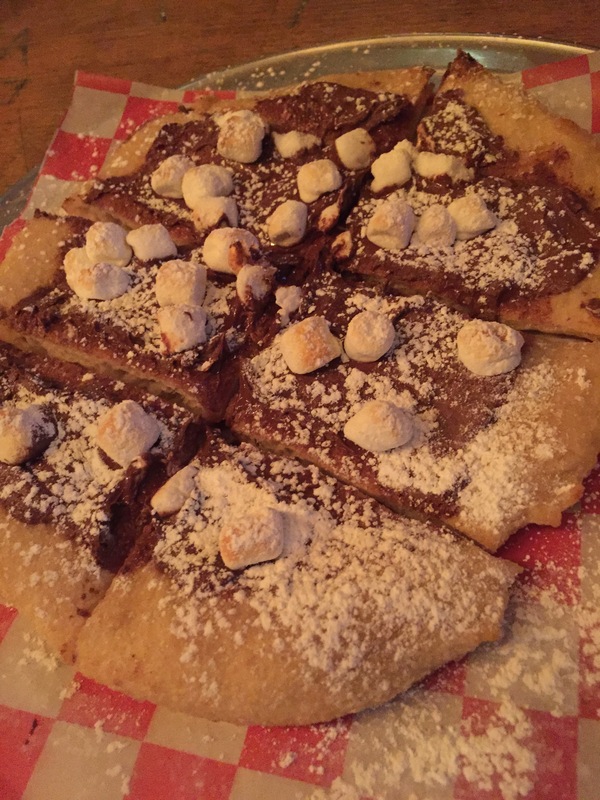 If you have a sweet tooth this one is for you and the perfect dessert to share because it is a little larger than a small pizza! 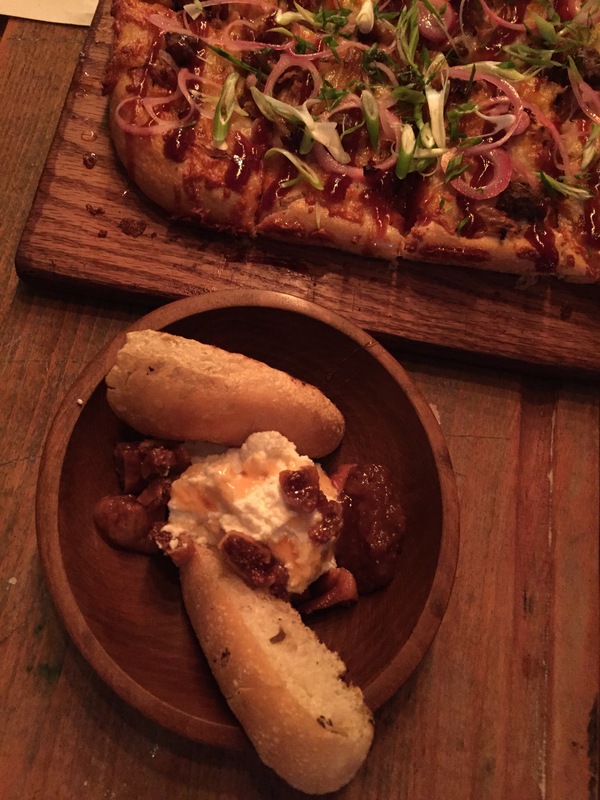 My love affair with pizza is reaffirmed every time I go back to Amore, and it just keeps getting better and better. 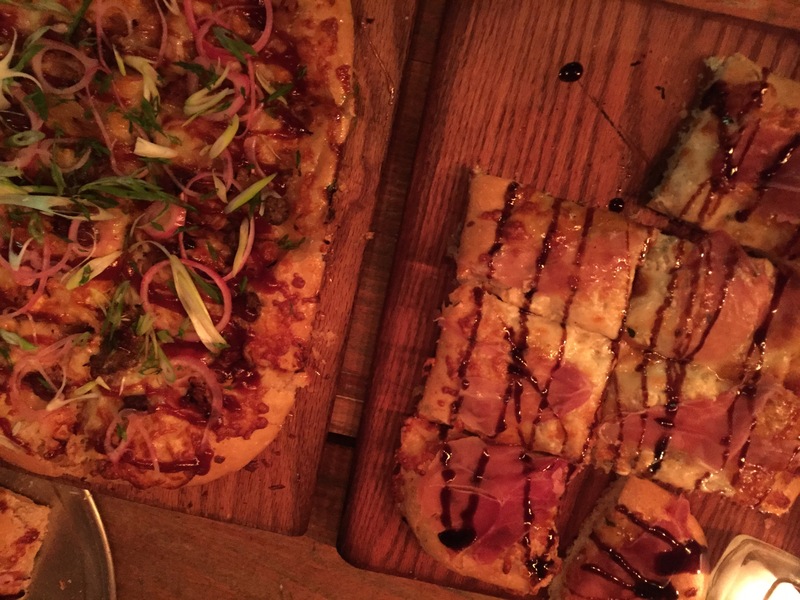 When you visit Amore Cucina & Bar you won’t just fall in love with their pizza, but quite possibly with everything on their menu. Oh my God! In the words of Liz Lemon: I want to go to there. And …. now I need pizza … and maybe some lasagna balls.